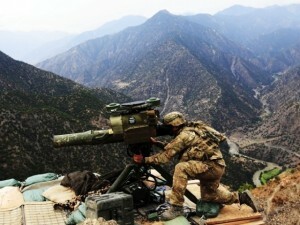 U.S. soldier Staff Sergeant Frankie Berdecia of Alpha Company 2nd battalion 27th infantry (the Wolfhounds), Task Force NO FEAR from Puerto Rico, operates a TOW missile system at Observation Post Mace in eastern Afghanistan’s Kunar province near the border with Pakistan August 28, 2011. From IHT. President Barack Obama’s administration has expanded its role in Mexico’s fight against organized crime by allowing the Mexican police to stage cross-border drug raids from inside the United States, according to senior administration and military officials. Mexican commandos have discreetly traveled to the U.S., assembled at designated areas and dispatched helicopter missions back across the border aimed at suspected drug traffickers. The U.S. Drug Enforcement Administration provides logistical support on the U.S. side of the border, officials said, arranging staging areas and sharing intelligence that helps guide Mexico’s decisions about targets and tactics. Officials said these so-called boomerang operations were intended to evade the surveillance — and corrupting influences — of the criminal organizations that closely monitor the movements of security forces inside Mexico. And they said the efforts were meant to provide settings with tight security for U.S. and Mexican law enforcement officers to collaborate in their pursuit of criminals who operate on both sides of the border. Former U.S. law enforcement officials who were once posted in Mexico described the boomerang operations as a new take on an old strategy that was briefly used in the late 1990s when the DEA helped Mexico crack down on the Tijuana Cartel by letting the specially vetted Mexican police to stage operations out of Camp Pendleton in San Diego. Recall that I recommended combined and even unilateral military operations against the cartels by U.S. forces. 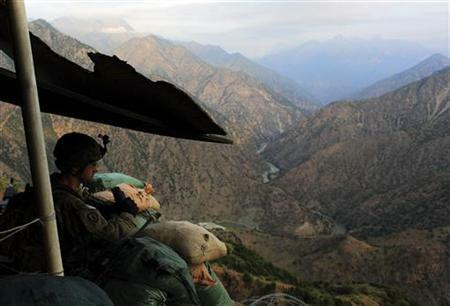 Do you reckon that Mr. Obama bargained for unilateral U.S. operations against the cartels? Or perhaps was it just a one-way agreement? Which is most likely? Bill Keller wants to get down and dirty into the weeds of the candidate’s faith. I’ll let you read his list of questions if you want, but of particular interest to me was this one posed to Michele Bachmann. You have said that watching the film series “How Should We Then Live?” by the evangelist Francis Schaeffer was a life-altering event for you. That series stresses the “inerrancy” ­— the literal truth — of the Bible. Do you believe the Bible consists of literal truths, or that it is to be taken more metaphorically? Good grief. Keller isn’t educated enough even to pose the question the right way. As he has posed it he blunders into the fallacy of the false dilemma. Let’s see if I can help out. Any thinking Christian has to answer Keller’s question, yes and yes. It is both-and, not either-or. The Bible contains simile, metaphor (which is extended simile), allegory, data and facts, parables (Jesus taught us in stories), wisdom literature (Psalms and Proverbs, Song of Solomon) and so on and so forth. Different rules of hermeneutics must be followed based on the kind of literature. Isaiah 46:9-10 and Ephesians 1:4-5,11 must be taken quite literally. The book of Daniel, quite obviously, is comprised of much that has to be taken figuratively. If Keller is referring to whether one believes in the historicity of miracles, then he should have posed the question specifically that way. Asking whether one believes in the inerrancy of the Bible is, equally stolid and incomplete. The Christian doctrine pertains to the infallibility of the autographs. These kinds of things – hermeneutics, doctrine – are taught in classes usually held in places such as seminaries. Keller might want to attend one before he tries to play ball in the major league again. He struck out this time. But I’m glad that Keller opened up the floor for discussion. Now it’s my turn. Mr. Keller is no defender of the second amendment, and the New York Times is usually considered to be the enemy of gun ownership. Very well. Here is the set of questions for Keller. Do you believe in individual gun ownership? If you don’t, is it based on a belief that mankind is too variable and prone to fits of rage to prevent himself from being a danger to those around him? Depending upon the answer to this last one, there are two followup questions. If the answer is yes, then please explain the moral flaw in your character that makes you this way. If the answer is no, then please explain to us why you would relinquish a tool that could be used to defend your family and loved ones from danger and death if in fact your are not susceptible to this moral flaw (also explain why this moral flaw affects everyone else but not you). As a related issue, why would you force others to relinquish these same tools to defend and protect their loved ones unless you were certain that they too suffered from moral flaws. Finally, if you do not believe in any system of faith at all, please explain your conception of this moral flaw. What is a moral flaw? I’m glad that we could have this conversation. I look forward to your responses. The 2nd Amendment’s “right to keep and bear arms” is proving to be a right to keep a gun at home, but so far not a right to bear a loaded firearm in public. But to the dismay of gun rights advocates, judges in recent months have read those decisions narrowly and rejected claims from those who said they had a constitutional right to carry a loaded gun on their person or in their car. Instead, these judges from California to Maryland have said the “core right” to a gun is limited to the home. Stephen Halbrook, an NRA lawyer, said “some judges have buried their heads in the sand and have refused to go one step further” than saying there is a right to have a gun at home. The uncertainty began with the Supreme Court itself. In 2008, Justice Antonin Scalia said the history of the 2nd Amendment shows it “guarantees the individual right to possess and carry weapons in case of confrontation.” But other parts of his 5-4 opinion stressed there is no right to “carry any weapon in any manner,” and that bans on “carrying concealed weapons were lawful” in the 19th century. Since then, hundreds of lawsuits have been filed to challenge gun restrictions. In California, federal judges in San Diego and Yolo counties rejected suits from law-abiding gun owners who were denied “concealed carry” permits. “The 2nd Amendment does not create a fundamental right to carry a concealed weapon in public,” U.S. District Judge Morrison England ruled in May. “That’s the cutting-edge issue: whether the 2nd Amendment applies outside the home,” said Chuck Michel, an NRA lawyer in Long Beach who has appealed the question to the U.S. 9th Circuit Court of Appeals. State judges in Illinois, Maryland, Massachusetts and New York have also ruled recently that there is no constitutional right to carry a loaded gun for self-defense. And in Virginia, the U.S. 4th Circuit Court of Appeals upheld the federal conviction of a man who fell asleep in his car near Washington’s Reagan National Airport with a loaded gun. So what is Savage talking about? The best summary statement can be found directly in the Petition for Write of Certiorari to the Supreme Court on behalf of Sean Masciandaro. So there are massive problems with Heller and McDonald. While I am a huge fan of Justice Scalia, he let America down on the issue of gun rights. Heller was too narrowly decided. To be sure, there is a second amendment right, and it applies to individuals, personally, and not just in the home, but everywhere else as well. I see bans on concealed carry, bans on high capacity magazines (e.g., California), bans on firearms based on type or function, bans on carry in places of worship, and so on, in the same category. They all violate the Second Amendment. The lower courts’ confusion is simply because they are confused. The Supreme Court shouldn’t have to spell it out that this extent. But moderately vague language in the SCOTUS decisions, progressive tendencies among the judiciary, and laziness of the American people to assert their constitutional rights, have led us to the point again where the stolid judges, lawyers, politicians and law enforcement officials everywhere must be told that Americans have a God-given right to self defense, at all times, in all circumstances, and by any means. In what could masquerade as a sad Orwellian novel if it weren’t true, an Idaho man defended his family from a potential grizzly bear attack, and is now in court defending his freedom. A man charged with unlawfully shooting and killing a grizzly bear had so many supporters at his arraignment Tuesday in federal court that the judge had to move the hearing to a larger courtroom. Rep. Raul Labrador, R-Idaho was asked about the case while appearing in Sandpoint on Tuesday. Based on a subsequent report, it isn’t clear whether it was Jeremy Hill or one of his sons who killed the bear, or if it was the mother or a cub. It doesn’t matter. There is a lot of local support for Jeremy, and in fact, Idaho Governor Butch Otter is appealing to Obama to look into the facts of the case. It’s ridiculous that it has gotten this far. The fact of the matter is that regardless of whether the federal government comes to its senses now or soon, some federal prosecutor (U.S. Attorney Wendy Olson?) made the sophomoric decision to carry this case forward. How embarrassing this decision must be for this attorney. It is said that exception makes bad law. Perhaps. But failure to address the exception makes for bad justice. Jeremy isn’t a poacher hunting bear in this area. He is a father and husband, defending his children and wife. It hurts progressives to hear it, but man is made in God’s image. Animals are not. The only evil that could possibly have happened that day would have been if Jeremy had failed to defend his family. When the framework for righteousness is found in the myriad rules and regulations that pass through the Federal Register every day as lawyers promulgate an increasingly burdensome bureaucracy on a hapless American public, America has lost its way, and has forgotten what true righteousness is all about. The justification for regulations has become deonotological, needing no foundation outside themselves, and the means has become the end without regard for consequences or affect. And it is all without heart or soul. Dennis A. Henigan, acting President of the Brady Campaign, waxes breathless in his most recent hysterical rant at Huffington Post. Remember two summers ago when most Americans were appalled by the sight of guns openly carried by protesters at presidential speaking events and town hall forums on the health care issue? Now it’s not just the protesters bringing guns to political events. Now it may be the candidates themselves. Texas governor and newly-announced presidential candidate Rick Perry has taken the incendiary mixture of guns and politics to a new level. When it comes to carrying concealed weapons, Perry certainly walks the walk. He has a concealed carry permit and proudly says that he carries a gun when he is out jogging. Rick Perry apparently doesn’t think the question is ridiculous. In fact, his sarcasm suggests he has no objection to political candidates carrying guns to campaign events; he seems to imply that he may do so himself. One thing is clear. The governor has been so thoroughly marinated in pro-gun ideology that he is unashamed about taking it to its logical extreme. If it is true that more guns in public places make us safer, why shouldn’t political candidates carry guns? Isn’t it the least they can do for their own safety? Something tells me that Perry wouldn’t be ashamed of taking gun ownership to its logical end, whether Henigan wants to call that “extreme” or not. But Henigan is getting increasingly worked up and hysterical over things, and he eventually drops this bomb. Yes, it is a good thing that senators can’t carry guns onto the Senate floor because the presence of guns, even carried by well-meaning, law-abiding citizens, increases the risk that arguments and conflicts will escalate to lethal violence. It is the same reason that our national parks are less safe because (due to legislation sponsored by Senator Coburn himself) concealed carry of weapons is now permitted within their borders. There you have it. There in a nut shell is the Faustian bargain that gun control advocates are willing to make. They don’t really believe that an individual cannot protect him or herself or family with a weapon. They don’t really believe that an individual is less safe with a weapon, regardless of what they might claim. What they believe is that there is a greater good to be served, and that greater good lies in not allowing provocations to escalate into deadly incidents. It’s their solution to original sin. Allow weapons and violence escalates. Remove weapons and utopia flourishes. But even here, Henigan cannot help but spuriously link an article that does nothing more than report that weapons are now legal in national parks. He claims that our national parks are less safe than they were because of this new latitude. And the article has nothing to do with this claim. Oh, but he has no evidence. In fact, I do. Several months ago I completed a FOIA request to the national parks service, and they returned to me an Excel spreadsheet with crimes outlined by type and delineated per year in the national parks. It doesn’t show what Henigan wants it to. In fact, our national parks are not less safe than they were prior to 2010 when firearms were made legal. And I did research most of the homicides (through local news accounts) and they mostly have to do with situation-specific (and sometimes bizarre) incidents involving individuals who had no right to carry a firearms anywhere because they were convicted felons, or prisoners on the run, or other such exigencies. Not one incident that I researched had to do with an otherwise law-abiding citizen who suddenly went berserk because he had a gun in a national park. Myths die hard. They are usually built on lies, and Henigan and the Brady Campaign freely traffics in them. Something as simple as a FOIA request can usually dispel silly myths like this one, and yet we know of at least one instance in which a man’s life was saved from a bear attack because of the new rule in national parks. He used a .45 handgun to drive the bear away. I’ll side with the new rule and gun ownership any day.